I was so excited and wanted to share this! 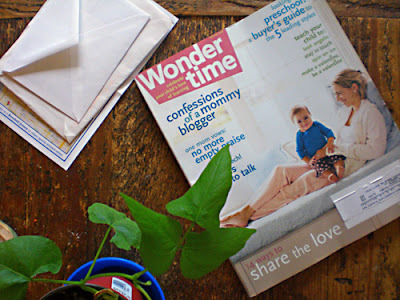 I came home to find the latest edition of Wonder Time on the table waiting for me to dive in! And just look at the cover, how prefect, one of the highlighted articles this month is Confessions of a mommy blogger. I haven't finished reading it so I can't tell you about the article. I love this magazine as much as Mothering, maybe a little more. Okay, maybe not; but about the same in different ways. I didn't sign up for a subscription when I discovered it because at the time I was still receiving a gazillion magazines that came as gifts and free subscriptions. But now that they have all expired my mailbox was feeling a little neglected and I was ready to receive this beautiful magazine in the mail every month. For me, it's like the Real Simple of parenting publications. Check it out if you haven't already! This picture in the No Comment Department at the back of the issue cracked me up because I was just pondering this very image in my head recently now that Harrison is older. I have friends who's children plastered stickers all over the back window of the car. Yes, it's a freedom of exploration and creativity that they get to express so freely. After all, it's their own little space that they are stuck in as we taxi them around from place to place, why not let them do as they wish with it, no? A glorious picture here, yes. A colorful reminder of a happy childhood all laid out on the window of the car like a road map. Only (true confessions) I just don't want stickers plastered all over the backseat window of MY car. Even if my car is old. I don't even like bumper stickers! I guess there are just some things that I can't let go of; but what Harrison doesn't know won't hurt him, right? If I don't give him stickers in the car, he'll never discover the idea of sticking them on the window and that's okay with me. Funny thing is, his stickers are all at his table in the living room right below the living room window. If they ended up in that window. I wouldn't care. What's the difference? I don't know. I'm quirky. So. How many of you have stickers stuck on your back window? And if you get ANY subscriptions to parenting magazines this year - I highly recommend Mothering and Wondertime. Go enjoy a good read! Now back to the regularly scheduled program. wondertime is good, isn't it! I need to get with the program - I've never even heard of WonderTime! Yes, I agree. No bumper stickers on my bumper and no stickers on the inside (or outside for that matter) of my car. I started to read WonderTime online after Catherine Newman started writing for them. It is a pretty nice mag. I wouldn't mind if my kids wanted to put stickers on the windows, I only have a problem with them putting them on wood furniture (ever tried to get those off???) 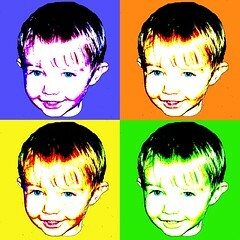 I've had alternatives available though....when Violet was little she used to put them all over her big plastic toybox. Olivia mostly puts them on her mirror closet door, and on her self! They also both love tattoos, so that takes care of that need. when you first started talking about putting your child's stickers on the car windows, i felt guilty pangs because i wouldn't dream of letting my kids do that--i'm a party pooper that way. so i was relieved to see in the next paragraph that you feel the same way. i know that it's ok to feel differently as parents, but that guilt creeps in so quickly, doesn't it? i'll have to check out the magazine. thanks for the recommendation. thanks for coming by my cyber place. i'll be back to visit again! Thank You for the Photo Love!